There is a common misconception about wood floor staining services in London. It’s not the same as finishing (a service we also provide). Coating wood with a product such as varnish to protect the wood and give it a shine is “finishing”. Staining a floor on the other hand means changing the colour of the wood. Usually wood is stained a darker colour. Because staining is fraught with potential problems an important step is to know what wood the floor is made of. We can help with that. Once we have identified the timber used to lay the floor we can advise the client about staining and colours. Some woods are far more porous than others. This means that some woods take staining better than others do. It may be that our experts advise against staining and recommend finishing with a material such as varnish instead. It is necessary to sand the floor carefully first. If a floor is badly stained it can look very ugly: streaky, patchy and dull. What’s more, any scratches, gouges or other imperfections in the floor will stand out. This is due to the fact that scratches etc. will absorb more of the stain than the smooth wood does. They therefore look darker and are very obvious. Why choose FK Floor Sanding? While applying stain onto a wood floor sounds easy, it is far simple. It’s not like painting, for example; a lot can go wrong. A properly stained floor has an even colour and a life and warmth to it. That is what we deliver to our clients. Here at FK Floor Sanding we have the skilled craftsmen to stain wood correctly. The client’s floor looks wonderful without it costing a fortune. 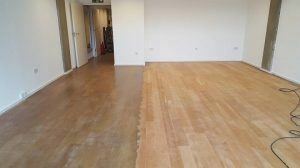 Our highly experienced and professional team members know exactly how to stain a sanded floor so that the stain is the colour the client wants, is uniform and is not blotchy or streaked. A stain that is correctly applied should bring out the grain and innate glow and beauty of the wood. It should also be kept in mind that a floor that has been stained can’t be walked on until it is completely dry. Depending on the product used, curing can take up to 72 hours although it is usually about 48 hours. This means that staining is unsuitable for certain areas and premises. If the floor does not cure properly the surface may begin to peel. The only way to correct this is to sand the floor and start again! Please call us on 020 3909 7641 and someone from our team will be available to answer your questions about wood floor staining services in London or book an appointment if you are somewhere in the Greater London area.